Red Toch is another one of those delightful garlics originally from the Republic of Georgia in the former USSR. This tiny country seems to have developed more garlics than everyone else put together. Red Toch is a nicely flavored garlic, a bit on the mild side and with very little heat. It is not quite as mild as Applegate and not quite as strong as Inchelium Red. The inner bulb wrappers have a little rosy pink coloration and are of medium thickness and easy to peel. Red Toch averages fairly large bulbs that are and it generally grows fairly clean under good conditions and has a few smaller inner cloves but no tiny ones. It, too, likes to finish off its growing season somewhat on the dry side, otherwise bulb wrappers can split. Chester Aaron in his books Garlic is Life and The Great Garlic Book, a guide with Recipes has well deserved praise for this garlic. Its fame has also spread from the Victory Garden series on Public Television. It is good for a garlic to gain a reputation for its flavor rather than its pungency. There's more to garlic than raw power, you should at least like the taste of what you eat. Some cultivars are so strong it's hard to tell whether they have any flavor or not. It's good to see this very nice garlic get some respect in a world of power hitters. On my dual scale it ranks a 6-7 for garlickiness and a 1-2 for pungency. Rich but very mellow. I had dinner with Chester Aaron and about 30 garlic experts in Tulsa one evening at a posh supper club that was elegant in every way. There were whole bulbs of Red Toch all up and down the linen tableclothes amid the candles and fresh flowers and all the Sterling and stemware and these scientists and a few of us ordinary folk broke those bulbs apart and ate them as appetizers with French bread and butter and with bulb wrappers everywhere, surrounding diners were invited to enjoy the feast - and did. Since eating garlic makes you feel good, literally, a great time was had by all, including the surrounding diners as memories that will last a lifetime were made that night. The chef appreciated the education he got in garlic that night. It usually grows rather well for us here in central Texas and is one of our family's favorites, especially for raw eating. 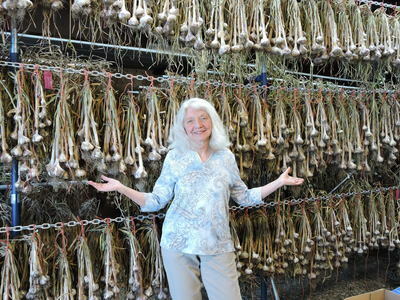 An old garlic catalog says its raw taste has been described as the perfect garlic taste. I don't know about that as I hope I haven't yet tasted the perfect garlic taste, but I do know that I like it and we will continue to grow it and use it at home. It is really nice to be able to have a wide variety to choose from as one's taste varies from day to day and even from meal to meal, so buy a few and try them and be sure to save some for planting this fall. It is a very early maturing garlic and is one of the first cultivars we harvest each year.